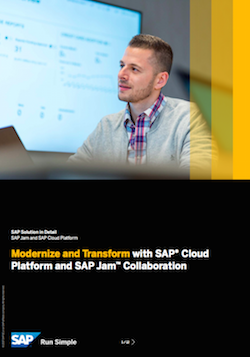 With the integration of SAP® Cloud Platform and SAP JamTM Collaboration, you can innovate intelligent, cloud-based applications that include key business, collaboration, and social capabilities. These technologies simplify the development, deployment, and management of applications to connect the right people and relevant information with mission-critical business processes. To learn more, download and read our guide today!